Do you remember this little dish of deliciousness from our menu last spring and summer? Known as Peter Rabbit, it featured the most flavorful, petite veggies — rosy radishes and tender carrots with their roots and stems still showing, and the snappiest sugar snap peas, plus young turnips and fennel which you didn't even KNOW you liked raw — with a housemade herb-y dip. Peter Rabbit couldn't have been more simple — crudités, is all — and yet it was a fast and furious hit at the distillery. We hadn't set out to put veggies-and-dip on the menu, because, uh, veggie trays are not known for their wow factor. But then we came across the veggies, grown by Dustin Rathgeber, the farmer/owner/veggie-whisperer behind Rathgebers' Garten, a certified organic farm in Odon, about 35 miles southwest of Bloomington. The veggies were so good, they put themselves on the menu. They were meant to shine on their own. Peter Rabbit was born, and we sourced other produce from Dustin for other dishes, too. His produce is grown thoughtfully and organically (and then some), and best of all, it has flavor — so much flavor, guys! — as though it came from someone's personal garden. In a way, it has. Dustin is a one-man-show. We buy food directly from this farmer when possible, and you can, too. Dustin is offering limited CSA shares this year with roughly 60 varieties of produce, and a weekly pick-up spot is right here at Cardinal Spirits. SAY NO MORE, SIGN ME UP. There are perks to picking up your CSA at the distillery: a 15% off coupon in your box every week, good toward food and drink at the distillery that day; and, an option to add on Cocktails To Go, a bottle of ready-to-drink Cardinal Spirits cocktails tucked into your box at pick-up. Dustin's story, in short, is this: he worked as a carpenter and a mechanic in Indianapolis, but in 2015, he returned to his family’s dormant 140-acre farm and revived an 8.5-acre plot into the certified organic Rathgebers’ Garten. On an uncharacteristically warm day in February, Dustin took a break from planting kohlrabi seeds to answer 13 questions about this farm and CSA. Dustin, what made you decide to start farming? I wanted to start my own business, and I always enjoyed gardening as a hobby no matter what my career was. I had my small garden in my backyard (in Indianapolis). Then, I converted all my flower boxes into more garden space, so I had corn growing by my front door and tomatoes by my sidewalk. All my neighbors probably thought I was crazy. I decided to make a go of it at farming. I get to watch everything grow and progress. It’s nice this time of year to be able to walk into the greenhouse and see what most people don’t see until April or May. My parents bought the property in 1997, next to the house I grew up in. The farm itself is 140 acres, and we’re about 35 miles southwest of Bloomington. It was an old dairy farm/conventional farm when we bought it in 1997. We converted part of it into a fish farm that my dad had when I was in high school and college. And then the fields, we used to harvest alfalfa and put up hay when I was in high school. That was the only crop we grew out there. For the past 20 years it’s sat fallow, there was nothing. The area that I have certified organic is 8.5 acres of that 140 acres. It sets up on the second highest point in Daviess County, so I don’t have to worry about runoff from a conventional farm. You refer to those 8.5 acres as a “garden.” But 8.5 acres is something! I guess it’s just the size. We call the property the farm, but I always think of it (the organic plot) as having a giant garden. It’s not your conventional farm. I’m not on a tractor or a combine. I’m out there with a garden hoes and tillers. And you do everything yourself, by hand? Pretty much — 99.99% of the time, it’s just me out in the field. This time of year it’s making sure the seedlings have enough water, and that the temperature and the humidity is right in the greenhouse. I have to check on that at least every 4 hours, through the day and through the night. Right now, I’m trying to get new sinks installed and things like that, making sure there’s not loose ends, because once March and April and May get here, it’s go-go-go out in the garden every day. What do you grow, and what are you known for? Right now, I’m doing about 60 different varieties of produce. I try to have anything and everything that you can find at the grocery store that can be grown in the state of Indiana. The thing people go crazy over is my lettuce. And carrots — that’s the other big thing. I grow a super-super-sweet carrot. I’ll have sweet corn, cucumbers, all kinds of summer and winter squash, cantaloupe, watermelon, radishes, beets, turnips. Will you grow anything new this year? What’s the most satisfying thing to grow? Carrots. It’s amazing how big of carrots you pull out of the ground. That’s always fun. The other is lettuce, because it’s such a fast harvest. What’s your favorite to eat? Probably sugar snap peas. I could eat snap peas all year long. I wish we had milder summers so we could grow them in the summer. They’re done in the middle of June at the latest. Rathgebers’ is a certified organic farm — which means there are standards for everything from planting to fertilization to storage to transportation — and you go a step beyond that. On top of following the USDA guidelines, I don’t even use any of the organic-approved herbicides or pesticides. I think that, too often, things hit the market without enough R&D. You don’t know what’s going happen in 50 years to something that people are consuming now. Nature has its way of figuring it out. Last year, I had aphids that got onto some of my zucchini plants, but within days I had thousands and thousands of ladybugs that ate the aphids. When you’ve got an excess of prey, the predators are soon to follow. Let nature take its course. What’s the next hot veggie? Cauliflower. Riced cauliflower has really hit the West Coast market, so I think around here, especially in Bloomington, it’s going to be higher in demand. Typically broccoli always outsold cauliflower but I think it’s going to even out, or cauliflower will take over. 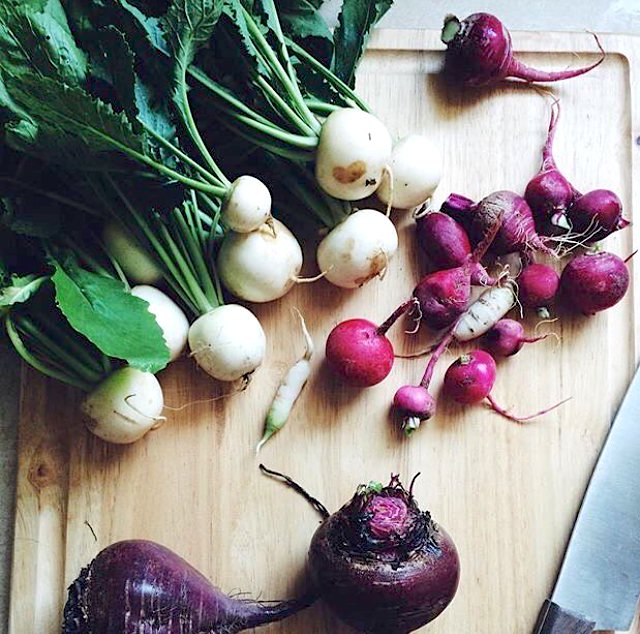 For your CSA shares, how do you keep the variety going week after week? I try to put a package together that I would want to eat. Out of 20 weeks (last year), I don’t think we had two weeks that were exactly the same. There was always something new every week. For half shares, they get the same variety that the full share is getting. I never want to overload someone with one thing. What can people expect in the full and half shares of your CSA? Usually at the beginning of the season, they’re going to get honey to start with from one of our beehives (Dustin notes that the honey is not certified organic). You’ll get lettuce and a lot of the cold crops: broccoli, cauliflower and cabbage, plus carrots, radishes, early turnips and beets, kale and chard, and sugar snap peas. A bit later, you’ll have peppers, eggplant, sweet corn, beans, and tomatoes, and then a little bit later, onions, okra and then we’ll swing back into the later crops, going back to turnips and beets. I also do dill, cilantro, basil, and oregano, and they’re just offered in season. I try to get dill the same time as cucumber, so if someone wanted to make a batch of pickles, they could. If anyone wants to buy something for storage — I get some customers that want 40 pounds of zucchini to make zucchini bread, for example — CSA customers are always welcome to check in for more. I do offer egg shares if people want to add those (Dustin points out that the eggs are not certified organic). Each share also gets some of your hickory syrup. Maybe that was a bit of a spoiler, but it's one of the things that makes your CSA special! Tell us more about it. You don’t make hickory syrup by tapping a tree. It’s like a simple syrup. I collect shagbark hickory and toast it in the oven, which gives it a smoked flavor. I make a tea extract with the bark, reduce it and make the syrup. Some people use it as a sweetener in their coffee. We use it on pancakes, waffles, French toast. It’s also really good to glaze ribs or ham, with because you can get that smoked flavor without actually smoking it. The Cable Car — with spiced rum, triple sec, lemon and simple syrup — is an excellent way to use our newest spirit, Valencia. Valencia is a beautiful, natural triple sec for cocktailing that we make with both dried and fresh orange peels to capture the sweet, bitter and fragrant character of citrus. If you've added Valencia to your bar cart and are wondering what to make with it, try our go-to: a Cable Car, which hails from the Starlight Room in San Francisco, is bright and always in season; as good on the coldest days in January as it is on the first day of summer. Our Valencia and Lake House Spiced Rum bring something special to this cocktail. Add all ingredients except for garnish to a shaker filled with ice. Shake well, then double strain into a coupe glass. Garnish with the lemon twist. Brew the tea according to package directions. 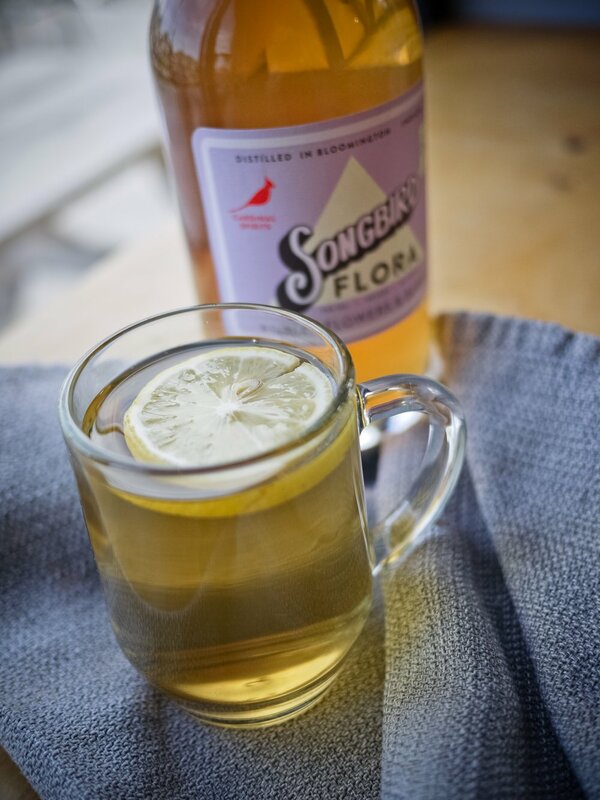 Combine Flora and the warm tea in a mug, then garnish with a lemon wheel. The easiest brunch drink you ever did see. Add liqueur and coffee to a mug and give it a lil' stir. 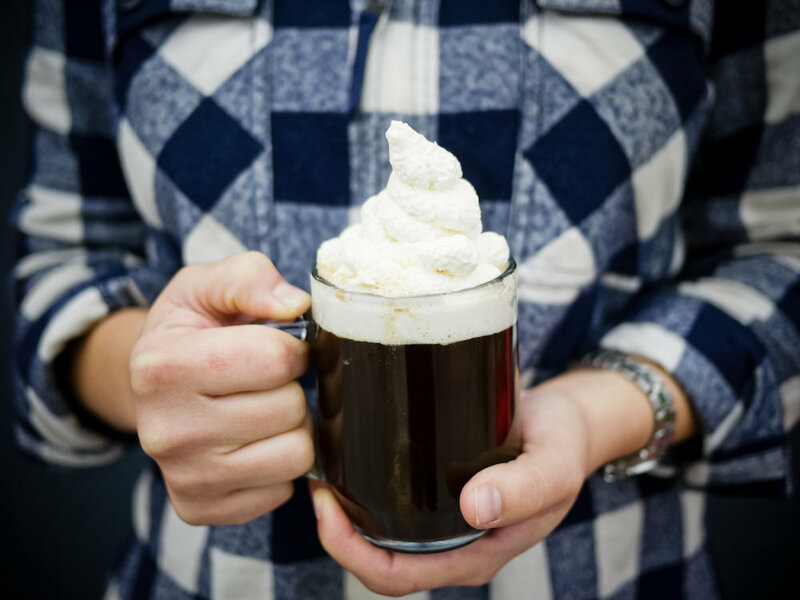 Top with whipped cream if you'd like. This is easily one of our favorite 2-ingredient cocktails ever. Our earthy, nutty Nocino (a liqueur that we make using Indiana walnuts) plus top-notch eggnog (we go crazy for the luxuriously smooth one from Traders Point Creamery in Zionsville, Ind.) equals dreamy holiday heaven. Combine Nocino and eggnog in a mug or rocks glass filled with ice. Give it a stir. Top with a dusting of cinnamon or espresso powder — or nothing at all ... it's just that good on its own. The warming spices of chai plus the fresh, woodsy profile of Terra Botanical Gin is the loveliest combo. Unexpected and unforgettable! Honey Schnapps, our newest spirit, is here! It's a celebration of honeybees — distilled and sweetened entirely with raw honey from our family's hives in northern Indiana. It's rare to see this liquid gold being distilled at all, but then we took things one step further to make it unlike any other spirit out there ... read on to find out the crazy little secret that makes this spirit so special. But, first things first: Honey Schnapps available now at the distillery by the bottle (full-size and cute-size) and in cocktails. It's a seasonal spirit with a soft, clean taste and a lovely, lingering honey essence. It's smooth and intriguing enough to sip on its own, but you'll love using it in cocktails at home, too — it's definitely an ingredient that makes you go, "wow, wow, wow!" when you sip. Meet brothers and beekeepers Walt and Dan. They're family-in-law of our cofounder Adam Quirk, and together, they have an apiary — a collection of hives — in the Fort Wayne area. 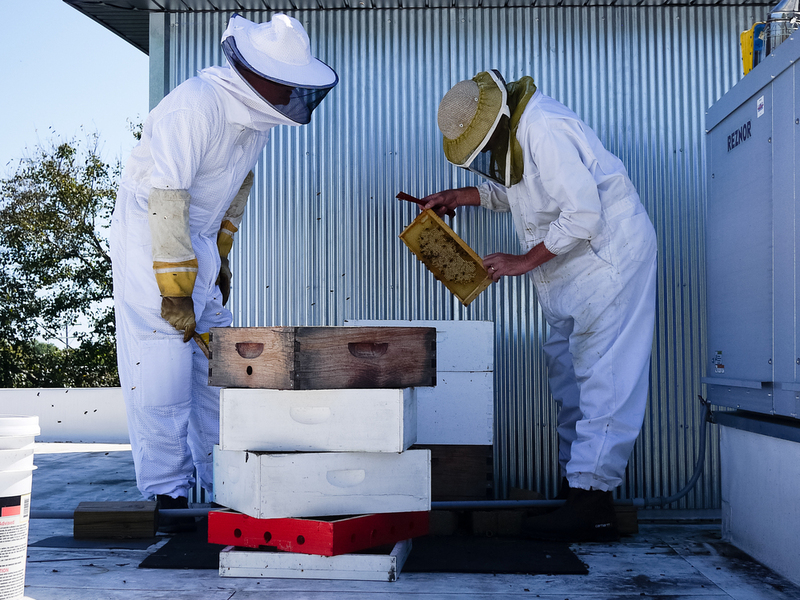 They even helped us put a hive of our own on the distillery's roof! We use Dan and Walt's honey in our cocktails, but after a huge harvest left us with waaaaay more than we'd ever need for drinks, we wondered: Could we use it to make a spirit? The answer is yes, and Honey Schnapps is it. We wanted this spirit to be in total celebration of honeybees, so we kept pushing for ideas. How else could we get bees involved? Remember that little secret we talked about before? Say hi to Matt Bochman. Is he our secret ingredient? No. Well, maybe, but we wouldn't embarrass him here by calling him our "secret ingredient." Maybe our secret agent? Point is: He found our secret ingredient for us — yeast from the bodies of the honeybees on our roof. Matt is a biochemist for Indiana University, and on the side, he's a yeast whisperer. What a gig! 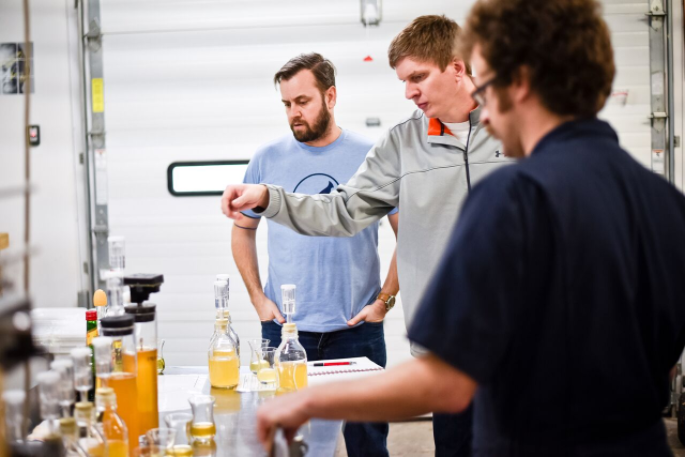 Matt discovers, gathers and grows proprietary yeast strains for craft brewers and distillers. His clients, like us, enlist him to find yeast that's more interesting, flavorful or unusual than what's commercially available. He's MacGyver-y about it - when he was in Jamaica awhile back, he squeezed citrus juice on a napkin and let it sit in the sun, then threw it in his suitcase and brought it home to add to his yeast library (he wouldn't have been able to take a whole orange through customs). Or he'll walk around IU's campus and snag local yeast from a tree especially for a brewery that wants to make a hyper-local beer. Matt helped with the yeast for our Tiki Rum and Landlocked Spiced Rum, and now, our Honey Schnapps. So we've got Dan and Walt's honey, and Matt's bee-body yeast. Here's how our distiller Justin Hughey (above) put it all together. He made mead (fermented honey) with the 1,500 pounds of raw Indiana honey from the family apiary, and the bee-body yeast. He distilled the mead, and finally, added more raw honey for sweetness. We finished as we do with all of our spirits: Labeling, numbering, bottling, corking by hand. Ta da: Honey Schnapps! Snag a bottle of our seasonal spirit for refreshing cocktails all summer long. This fresh and fruity cocktail by our bartender Chris Resnick is refreshing and perfect to sip on in this spring weather. This has been a fan favorite from our spring menu, so now we've decided to share the recipe! Go ahead, give it a try. To make the raspberry mint syrup, bring 1 cup of sugar and 1 cup of water to a boil. Then add 1 small package of raspberries and a handful of mint. Muddle until the sugar is dissolved, then let it simmer for 10 minutes. Add all ingredients to a shaker and shake vigorously. Strain into a Collins glass and top with tonic water. This Penzance Punch will be a punch to your taste buds, but in the best way possible. Try making this delicious cocktail at home with this recipe, created by our bartender Chris Resnick. To make the cilantro honey lime syrup, combine 1 cup of honey and 1 cup of water with a small handful each of mint and cilantro, then fine strain it. Add all ingredients to a shaker and shake vigorously. Strain into a rocks glass and top with an ounce of soda. Springtime means tiki time (Tiki Rum, that is)! Channel some tropical vibes into this refreshing drink that's perfect for sipping under the hot sun. To make the mango papaya tea infused tiki rum, put 1 tablespoon of loose tea into 375 ml of rum and let it sit for 2 hours. Add all ingredients to a shaker and shake vigorously. Strain into a coupe glass and garnish it with a lime.